Here’s the thing I was very aware of this time: do you know how tiny Fatehpura (Raees hometown) is? TINY!!!! Super small. Like, doesn’t even have a full wikipedia entry kind of small. Which made me think about the whole film differently. Maybe it’s not about our hero rising and rising until he finally falls. Maybe it’s about our hero always being kind of a small town guy who is manipulated and used by the big city folks. One image that struck me in that opening childhood sequence in the film is when our hero first tries out his new glasses. He climbs to the top of a clocktower with his friend and uses his new sight to look around their world and spot a mechanic cleaning a car, the doctor in his office, and so on. And finally, the police about to raid the distillery which supports all of them. The point isn’t the liquor or the distillery, it’s everything else. Their whole community rests on this one industry, and the community is the point. This carries through to later, when the romance starts so seemingly suddenly. We never see a “first meeting”, we are dropped right into the middle of a routine with Shahrukh hitting a cricket ball onto the roof of her house so he has an excuse to go inside and see Mahira. And they are already flirty and seemingly in love, before we’ve seen anything else of their relationship. But, if this is a “village” movie, then there wouldn’t really be a “first meeting”. This is presumably a girl he has known off and on his whole life, who has suddenly become the biggest flirt and beauty of the district. While he has become the biggest leader and richest young man in the area. Naturally, they would gravitate towards each other. And their whole romance changes then, right? This isn’t a romance of glamour and excitement, this is a boy pulling the pigtails of the girl he likes. And the way Mahira becomes more of a business partner in the second half, that makes sense, because they were both brought up in this industry and this criminal environment, they had the same “training”, it’s not like he married some innocent rich girl, or low class naach girl. This is someone who saw the same things he did and knows the same things he does just from growing up where they grew up. If we look at it from the “village” side of things, then Nawazuddin becomes more clearly the “villain” of the whole thing. He is the outsider who doesn’t understand the local economy or environment and customs and shakes things up and breaks a stable pattern. It’s got to be on purpose that the illegal trade chosen is the Gujurati bootlegging, right? Because it is the most moral immoral possibility. Alcohol bootlegging is always kind of a hard sell as “super evil”, since it is such a part of everyday life. And in this instance, it’s legal everywhere else in India, it’s just this one particular state that is dry. More over, from the little background reading I did, it’s not just Gujurati addicts who are buying from Gujurat. It’s actually cheaper to buy it illegally there, than legally in other states and pay the taxes on it. In fact, part of the reason it might still be “illegal”, is because the tax-free sales bring so much money into the state that the government wants to keep it rolling. So our hero and his whole neighborhood doing this business is not because they are innately evil or uncaring, it’s just what everyone does and has always done. They even go a step further and show the very opening when there was a “country whiskey” still going, which really is harmful due to the high alcohol levels and funky ingredients and so on, and how after there were deaths from that liquor, our little hero decided to only bootleg legitimate alcohol that was brought in from elsewhere. It’s a completely harmless trade, the exact same stuff you can buy and drink legally just a few miles away, only sold here without taxes attached. Watching the film with this in mind, and aware of how it ends, you can see it as Nawazuddin as sort of an Inspector Javart figure, overly invested in law and order. More than that, as the figure that drives Shahrukh to the dark side. Look at how they interact. Shahrukh sets up his business and donates books to the local school and supports the local economy, and is generally good for the people. Nawazuddin comes to town and starts pushing back at the trade. His pressure is what inspires the other bootleggers to consider banding together. And, once that is suggested, Shahrukh sees the chance to take control and consolidate his territory. Nawazuddin blocks all the roads in an attempt to trap Shahrukh’s shipment; Shahrukh is driven to partner with Damla Seth, and take over the seas as well as the land. It is this growth that leads his former boss Atul Kulkarni to see Shahrukh as a threat, which leads to the first massive gunfight and murder spree of the film. Once Nawazuddin is transferred and gone, Shahrukh turns even more to the “good”. He buys sewing machines for the neighborhood women, he forces the local mill owner to pay his employees, his business grows but, again, he isn’t actually harming anyone. If you watch the film, there is never a scene of a dangerous drunkard or a desperate addict. There is no harm in the alcohol itself, it is all in the business surrounding it. And even the business is not that bad until, again, Nawazuddin gets involved. Shahrukh went head to head with Atul before, when he wanted to go out on his own. But he was able to navigate that situation peacefully. It was only when police pressure heightened the situation that it got out of control. And the same thing happens again in the second half. Nawazuddin leaks the content of Shahrukh’s conversation with a politician, which is what forces him to follow through on his threat to start a riot if the politician comes through his area. If you notice, after that initial angry phone call, Shahrukh pounds his hand on his desk and then slowly flattens it out until he just gently taps and asks for tea. His anger is spent, he may have forgotten the whole situation. But Nawazuddin purposefully chooses to exacerbate the situation by publicizing it, which leads to a riot. And the riot leads to Shahrukh being in jail, which leads to him spending money to run for office and get elected so he cannot be touched again. That expense, plus the expense of feeding the neighborhood during a police ordered curfew, plus the expense of losing his investment in his construction project thanks to politicians who became his enemies thanks to Nawazuddin’s interference, all of this is what drives him to being deep in debt and desperate. And this is where “Musa” steps in, the Bombay boss. If Nawazuddin is putting pressure on him from one side, Musa is applying it from the other. And they both only see Shahrukh, and the people around him, as something to be used for their own purposes. Nawazuddin sees it as a game, he wants arrests, to see his power of law take over the powers of chaos. There is no greater motivation for him, no tragic backstory, no emotion. He just follows the law because it is the law and he wants to defeat Raees because he challenges that law. Shahrukh does a magnificent job in this scene. The first time I watched it, I saw it as just processing the betrayal of his old friend. But it’s more than that. While he is on the phone with Musa, you can also see the shock and hesitance when Musa offers that he should “take” Atul. He feels the pressure of expectations, that this man who is more powerful than he thinks the response should be lethal. And thinks that he is capable of a lethal response. If Nawazuddin and Musa had never entered Shahrukh’s life, he might have been happy as a small unambitious bootlegger in his hometown. It was this pressure from both sides which made him expand his operation, grow increasingly more lethal, and ultimately be used as a pawn in a game in which he has no role. I was watching for it the second time, and I still think there isn’t enough lead up to Nawazuddin’s switch turning right at the end. He has been a Javart figure, obsessed with rules and regulations. And with playing the game with his mind. And now, suddenly, he is torturing people and killing in cold blood. And it’s not even like he is killing because of “the rules”! His superior wants to arrest Shahrukh and have him stand trial. It is Nawazuddin who insists on killing him instead, against orders and without authorization. Really, the whole last 20 minutes feels unnatural and unrelated to what has come before. Even watching knowing it is coming, following how Musa has set him up for years as a potential fall guy and how Nawazuddin is increasingly cold and calculating, it still doesn’t work. 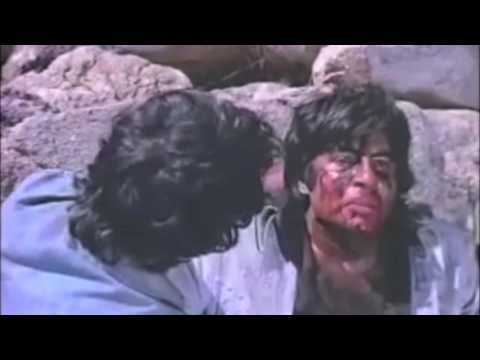 I don’t have that “grand destiny” feeling that I have when I watch Deewar or Sholay, that this was a character never fated to be happy. Instead, it feels like a series of random incidents of bad luck and poor decisions. The one thing that does work really well for me is when Shahrukh cries out that “in trying to save my neighborhood, I burned down my city.” That is a good resonant theme. All along, his character has been focused on his own small town and community. For that focus to have put blinders on him to the bigger picture, and for there to be shock and guilt when those blinders are removed, that I could believe. But not the way it happened! Even if he is desperate for money, we have seen him desperate before, there is no reason for him to take this sketchy job to earn it. And no reason for him to fall for the obvious game Musa and his second-in-command are running on him to get him to agree. And heck, why exactly is he even desperate? We learn that it all went for the free food they are giving the neighborhood during curfew, and that he needs to pay back the down payments his friends made on their units in the new construction which has stalled. But, this doesn’t really hang together. If he still has the alcohol, and they know the curfew will lift at some point, won’t everyone be willing to just wait and be paid back later? What’s the rush? It just doesn’t work as the kind of high pressure situation that is being presented. They needed to get us to the sacrificial Amitabh/crime doesn’t pay message. But the way they got there just doesn’t add up. Nawazuddin turning cold-hearted illogical evil all of a sudden, and Shahrukh turning into a scared babe in the woods. Really, it doesn’t add up because there IS no logical way to get there! Shahrukh has been clear all along that no business is too small (so he won’t be afraid of starting over and therefore driven to do something he shouldn’t), and that business is only good if it harms no one (so he won’t be doing something that will bring vengeance down on him). And Nawazuddin has been clear all along that he follows the rules and sees this as a game, not life and death. What would make a lot more sense is an ending of Nawazuddin bending the rules to help out Shahrukh, having realized that Shahrukh has an ultimate moral authority. Or Shahrukh taking Nawazuddin on as one of his “people” that he has to protect and defend. I guess what I’m saying is, I didn’t feel an ultimate conflict building between the two of them, I feel an ultimate coming together building up. It feels like two world views that will ultimately meet. What feels like the real conflict is between Shahrukh and the crooked politicians. While Shahrukh’s world view involves fair dealing and honesty in trade, along with a strong sense of responsibility for others, the politicians are the opposite, presenting a false face to the world, using people for their own ends, weak and grasping and uncaring. And yet, in the end, these characters are dropped and play no clear role in his downfall. Also dropped is the storyline in which Shahrukh runs for office. He wins, but we never see any real after effects of that. Maybe that is the turning point of the film? The moment it leaves the track it was one and jumps over to a forced tragedy? What might make more sense is, after Shahrukh has been released from jail and won his elections, he starts using those same smarts and daring to climb the political ladder. If we see him force his way into a coalition. If we end with him being Nawazuddin’s boss, and giving him orders “in writing”. Finally being the kind of boss Nawazuddin (and therefore the state as a whole) can respect. I think that’s where it went wrong in the narrative, going from the election to the over-reach of the housing development and then the illogical fall from grace. But I wonder where it went wrong in the production process? I know this film had a lot of variations. Dholakia was researching and writing it for years. And then he got Farhan Akhtar to sign on to produce and star, playing the cop character. At which point, I assume, the cop had a much larger role. And then Farhan brought on Shahrukh to play Raees, which surely changed the perception of that character. Probably brought in the song sequences and romance track that wouldn’t necessarily have been there before. And Farhan himself dropped out, which changed the conception of his cop character to something softer and more Nawazuddin-y. If it had been Farhan’s film, might the Raees character have been something a little closer to Emraan in Once Upon a Time in Mumbai? Less the mixture of lover/friend/fighter, and more just the crazed fighter we saw in his murder spree scenes? Or might it have gone the other way? The Raees character being more clearly the savior and innocent victim, rather than this super hero action star? I keep going back to that first teaser from well over a year ago. For a movie that was supposed to release on Eid. The very first scene they shot was Shahrukh standing up for his people and beating the living heck out of a politician invading his territory. Is that the movie this was going to be? Shahrukh being the angry Muslim avenger? And then the protests started, and they got scared off of it, put in an ending where he is defeated for no particular reason? This entry was posted in Shahrukh and tagged Film Reviews, Full Plot, Nawazuddin Siddiqui, Raees, Shahrukh, Shahrukh Khan, Spoilers by mredlich21. Bookmark the permalink. Great review, with lots to think about! I read Nawazuddin’s character as much more ego-driven and just “off” from the beginning of the film. I think one interesting contrast between Raees and Majmudar is that Raees is surrounded by long term, warm relationships, while Majmudar’s only lasting relationship seems to be his dog. I see Majmudar’s pursuit of Raees as being very “Ah, here is a worthy adversary of me, supercop. I will show him.” And then repeated failures to take Raees down drive Majmudar into darker and darker territory. I see what you mean about the weak logic of Raees’ desperation being so great that he takes on the clearly “iffy” job from Musa. Maybe this is where Raees’ ego gets the best of him–he can’t deal with needing some help from “his people” and being revealed as merely human. Hmmm–will think about your points on my second watch. This weekend, I hope! I have a hard time with Nawazuddin’s character partly, I think, just because he is played by Nawazuddin! So I find him automatically likeable and kind of sweet and charming. Which doesn’t make any sense here, your version of a supercop with no human connections makes a lot more sense. It would also explain why the ending leaves such a bad taste in the mouth, because it is evil triumphing, the heartless cop killing the noble good guy. Would have been much more satisfying if instead of Shahrukh being confronted with his culpability, it was Nawazuddin being confronted with how his single-minded pursuit of Raees led to the escape of a much greater evil (which, come to think of it, is kind of how Once Upon a Time in Mumbaii plays out!). I think the problem with the motivation at the end might go back to the iffy timeline all along. If he had borrowed money from his neighbors ages back, and now they would lose their homes unless he paid it back or something, then I could buy his motivation. But if it hasn’t been long enough for his kid to get bigger than maybe a 2 year old, I just don’t see the urgency in paying them all back. Is it just me, or there are people who argue that Raees childhood portions delightfully remind the Goodfellas? I think I saw the good fellas argument somewhere, but I don’t know whether or not it holds up because I still haven’t seen goodfellas. This is honestly the best and most intuitive review of a Bollywood movie I have ever read. Everything you mentioned resonated exactly with my own thoughts. I completely agree that for a police officer who held the laws of the state at such a high stature, and then to suddenly break the law himself by commiting murder, while Raees’s own actual crime was smuggling between state borders. At first I thought this to be irony, but later after reading your review in conjuction with my own opinion of the ending of the movie, it became clear to me that rather than an ironic story line there was a huge mistake done by the writers of the script. Thank you so much! I really appreciate the kind words. Raees is such a difficult film, and had so many filming changes, I have to wonder how different the original script was from the censored and edited and massaged-for-SRK script that we got.